It’s often said that creative people can be a little odd. I’m not sure it’s entirely true—artists have always needed to have at least some kind of practical streak just to get by. But while there are plenty of enterprising authors, painters and musicians who are reasonably grounded (whatever that may mean), there are others whose eccentricities are seen as proof that being creative often equates with a little kookiness. Australian-American composer Percy Grainger liked to dress in multi-coloured terry towelling clothing of his own design and sleep naked under his piano. Crime writer Agatha Christie liked to write while sitting in the bathtub. English writer HG Wells always carried two pens with him, saying he needed a big one for long words and a smaller one for little words. Oh yes, there were some quirks alright. Let’s look at five somewhat bizarre behaviours of some famous creative people. Early in Chapter 1 of the much-loved book Peter Pan is the sentence: “Mrs Darling was married in white, and at first she kept the books perfectly, almost gleefully, as if it were a game, not so much as a Brussels sprout was missing…”. Scottish novelist and dramatist JM Barrie (1860-1937) had a kind of fascination with Brussels sprouts and when dining out he often ordered them, although they always sat on his plate uneaten. When asked why he continued to order them when he obviously didn’t like them he answered, “I can’t resist. The words are so lovely to say.” Barrie, it seems, was less interested in the nutritional value of eating Brussels sprouts than the thrill of articulating the words. A Love Supreme, the 1964 album from jazz giant John Coltrane (1926-1967), is almost universally acknowledged as one of the greatest jazz albums ever recorded and is still listened to with as much fervour today as it was when it was released over 50 years ago. 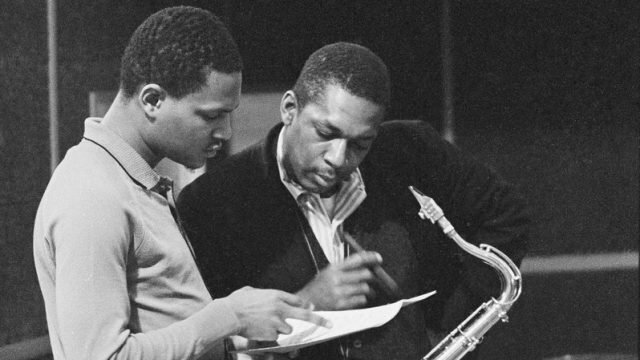 Coltrane died of liver cancer at the age of just 40; a short life, but enough to guarantee him the label of one of music’s most influential and revered saxophonists. One of his eccentricities was a fondness for lederhosen. Between 1963 and his death in 1967 he collected more than 300 pairs of the traditional Bavarian garment. But the lederhosen didn’t merely sit in a cupboard—Coltrane and his wife, pianist Alice Coltrane, used to throw barbecues for their friends at which they wore their favourite pieces. And perhaps most surprisingly, they’d hire a local oompah band to provide the entertainment. Among the works of German poet, playwright and philosopher Friedrich Schiller (1759-1805) is the poem Ode to Joy, later used by Beethoven for his mighty ninth symphony. Schiller’s plays—Mary Stuart among them—are hugely important in the German classical canon and his philosophical works often focus on the notion of freedom. His was a driven personality and he liked to work late into the night. To avoid falling asleep, he’d often keep a basin of cold water by his desk so he could dunk his feet into it, a sure fire way to stay awake. He’s also reported to have always kept rotten fruit in his desk drawer, telling his friends that the rank odour not only prevented him from nodding off but also actually motivated him. German composer Richard Wagner (1813-1883) is primarily remembered these days as Hitler’s favourite composer and the man who wrote The Ride of the Valkyries, used to great effect in the iconic 1979 film Apocalypse Now. He had a massive impact on the development of Western music and effected dramatic changes in the staging and direction of modern opera. What isn’t widely known is his love of rich perfumes and luxurious fabrics like satin and velvet. His workplace was full of velvet rose-scented cushions, which he also had located right above his bath, one he always filled with perfumed oils so that their gorgeous scents would reach his nostrils from below and inspire him to compose. He also maintained that he composed best when he was wearing pink silk underwear; and he liked to hold a piece of fine silk, stroke it and run it through his fingers as he penned his works. French composer Erik Satie (1866-1925) best known for his works Gymnopédies (1888) and Gnossiennes (1889-1897) never had to think about what to wear each day. He owned twelve identical light grey suits and wore one at a time until it became a little shabby, whereupon he’d move to the next one in the wardrobe. But more interestingly, he had a thing about pale-coloured food, white food being preferred. In his own words: “I can only eat white foods: eggs, sugar, scraped bones, fat from dead animals, veal, salt, coconuts, chicken cooked in white water, rice, turnips, things like pasta, white cheese, cotton salad and certain fish.” It seems he was a little more liberal with what he drank, absinthe or “the green fairy” being a favourite tipple, which is a shame because he died of cirrhosis of the liver. Creativity and unconventionality—perhaps there is an argument that they do go hand-in-hand after all.